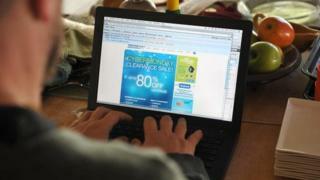 Cyber Monday is expected to add to one of the busiest weekends for online shopping, following Black Friday. Shoppers are expected to spend almost £1bn online on Monday - up almost a third from last year, according to analysts at Experian-IMRG. Sales are expected to hit record numbers over the weekend, following the Black Friday sales promotions. Amazon said it had its biggest sales day in the UK on Friday, selling more than 7.4 million items. Visa Europe said: "It looks like Black Friday has cemented its place as the busiest online shopping day of the year. "More than £760m was spent online with Visa cards, up nearly 25% on last year," it said, adding that £2.2bn is predicted to be spent online on its cards over the four-day period. Department chain John Lewis said that this year's Black Friday saw its biggest ever single-day trade, up 11.9% compared with last year, mainly driven by sales on its website. According to Experian-IMRG, £1.1bn was spent online on Black Friday, up more than a third from last year. Based on the number of items sent from online retailers over the weekend, Royal Mail said that most online shopping orders came from Norwich, Dorchester and Exeter. The chief executive of Very.co.uk and Littlewoods, Alex Baldock, told the BBC said that he expected this year's Cyber Monday to be bigger than Black Friday last year. But he warned customers that deliveries could take as long as 10 days rather than the usual 48 hours, adding that he expects 100,000 new customers to log on over the period. Adding to warnings about deliveries, logistics expert Stuart Higgins from LCP Consulting told the BBC that Black Friday's orders equated to about 22 million parcels, with a similar volume expected to be generated on Monday. However, he added: "A staggering 10% of that won't be delivered on time and that's because retailers haven't got their back-end fulfilment capabilities - their organisation, processes and infrastructure - in place to cope with the marketing hype that has been created around Black Friday." After chaotic scenes at some stores on Black Friday last year, this year saw much calmer trading as more shoppers decided to hunt for bargains online. Analyst Miya Knight from Planet Retail said that Currys and PC World saw online traffic increase 1000% on the morning of Black Friday.